The Christian Life Centre. 51a East Street, RH12 1HR. Free Entry / Offering at end. All welcome and do bring friends. 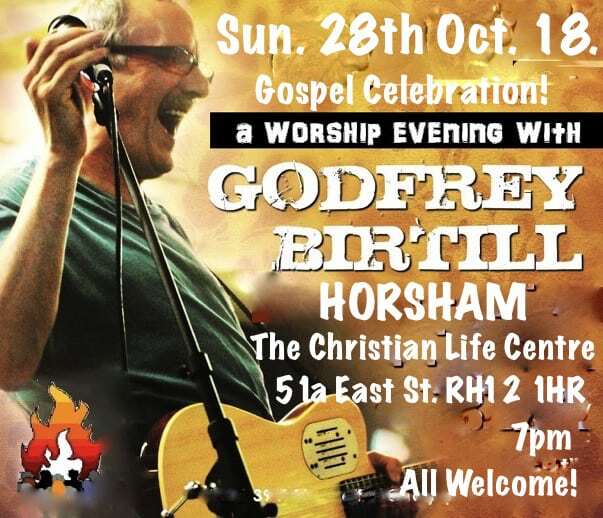 An evening of Celebration, Praise, Gospel and Testimony with Godfrey Birtill, a prophetic Christian songwriter. For more information and to hear Godfrey please visit www.godfreybirtill.com. One of his songs – CBC Praise and worship song of the year ‘Just one touch from the Lord’. If you know that you intend to come please let Gillian Martlew know – email gillianmmartlew@gmail.com and she can reserve seats but this is not essential.